Resource Center of the Americas - New World Media. Border & Latin American Information - Molly Molloy, New Mexico State University. Bilingual Education and English as a Second Language Resources - Marty Levine, CSU Northridge. Center for Latino, Latin American, and Caribbean Studies - University at Albany. Center for Mexican American Studies - University of Texas, Austin. Center for Multilingual, Multicultural Research - University of Southern California. Chicano Art Digital Image Collection - A representative sampling of the vast, cataloged archival images in Chicano visual arts in the California Ethnic and Multicultural Archives (CEMA). CEMA is based in the Department of Special Collections in the Davidson Library at the University of California at Santa Barbara. Chicano and Chicana Space - Thematic, inquiry-based art education resource. Chicano/LatinoNet - CLNet: Chicano Studies Research Center, UCLA. Mauricio Gastón Institute for Latino Community Development and Public Policy - University of Massachusetts, Boston. Julian Samora Research Insitute - Michigan State University. LASPAU - Academic and professional programs for the Americas, Harvard. Oral History Project: Voces - This project seeks to document and create a better awareness of the contributions of Latinos and Latinas of the WWII, Korean War and Vietnam War generations. Teresa Lozano Institute of Latin American Studies - University of Texas, Austin. Tomas Rivera Policy Institute - Policy institute examining issues such as education, political participation of ethnic minorities, information technology, access to healthcare, economic well-being, media, and immigration. Cortada Mural Art - Xavier Cortada. Museo del Barrio - New York. Museo de las Americas - Denver, CO.
Self Help Graphics and Art - East Los Angeles. Hispanic Research, Inc. - Marketing research and video reports. D.C. Latino - Latino Directory for the Washington D.C. area. National Puerto Rican Coalintion, Inc.
California Mission Studies Association - California's Native American and Hispanic past. Librotraficante - Latino-rights activists are challenging Arizona’s ban on school books and courses that provide students with information about Mexican-American history and culture. RAZA.ORG - Research, activism, art, job searches, immigration rights, news and media. MANA - A national Latina organization. qvMagazine - Latino men's journal of style, culture, and entertainment. LA CUCARACHA - Editorial Cartoons by Lalo Alcaraz. Virtual Varrio - Pocho Productions. Al Día - Focused on the U.S. Latino experience. Arte Publico Press - Bilingual press at the University of Houston. BrownPride Online - Latin webazine. Chicano - Information and Curriculum materials for this PBS series. Chicanos/Latinos in Film and Television - University of California, Berkeley. Cinergia: Latin American Film - Cinergia was created and is maintained by Sophia A. McClennen, Associate Professor Pennsylvania State University, with the help of scholars and students of Hispanic cinema. En Español - Atlanta, Georgia. Frontera NorteSur - New Mexico State University. Galan Productions - Producers of the PBS series Chicano! and other Latino videos. 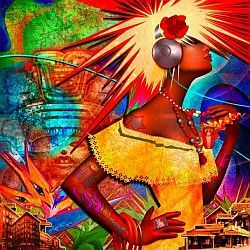 HispanicLife - Music and culture of San Antonio. Latinos and Media Project (LAMP) - Hosted at the University of Texas, Austin. Latino USA - National Public Radio. Model Minority - Research articles, commentaries, stories, and other documents on the Asian American experience. La Raza Online - Spanish-language weekly. My American Girls - A Dominican Story - The lives of the Ortiz family, first generation immigrants from the Dominican Republic. The film encompasses the contradictions of contemporary immigrant life. SalsaZine - Music, interviews, recipes, teenzine, and chisme. Alegria - Mexican Folklorico home page. Alliance of Latino Theater Artists (ALTA) - Promoting, educating, representing, and unifying Latino/a identified artists and their allies in the Chicago area. Border Cultures: Conjunto Music - Benson Latin American Collection, University of Texas at Austin. Puro Mariachi - A comprehensive guide to mariachis on the Internet. Mora Arriaga - International mariachi show. WAYANAY INKA - Traditional Andean music in San Antonio, TX. Women in Mariachi Music - From Mariachi Publishing Company, a resource for professionals, teachers and students. Day of the Dead - Mexico Connect. Santería - A syncretistic Caribbean religion. Soy Hechicero - Stories of santería in New Jersey. Zoot Suits - At Suavecito.com. Bordering the Future - A variety of information from the State of Texas. Hispanic Bar Association of D.C.
Farmworkers Website - With the Mexican Braceros Project. Hispanic Federation - Network of Latino non-profits. Seeks to serve Latino community by building and supporting Latino institutions. Information Services Latin America (ISLA) - Provides information on the U.S./Mexican Border. Labor Council for Latin American Advancement (LCLAA) - Advances the economic condition, educational attainment, political influence, health and civil rights of Hispanic Americans through community-based programs operating at more than 700 LULAC councils nationwide. League of United Latin American Citizens LULAC) - California. Mexican-American Legal Defense and Education Fund (MALDEF) - A leading nonprofit Latino litigation, advocacy and educational outreach institution in the United States. MALDEF's mission is to foster sound public policies, laws and programs to safeguard the civil rights of the 45 million Latinos living in the United States and to empower the Latino community to fully participate in our society. MANA - A U.S. national Latina organization. National Alliance of Latin American and Caribbean Communities (NALACC) - A network of approximately 75 community-based organizations led by Latin American and Caribbean immigrants. NALACC member organizations are working to improve quality of life in their communities, both in the United States and in countries of origin. NALACC seeks to build transnational leadership capacity and increase immigrant civic participation, so that immigrants can advocate effectively for public policies that address the root causes of migration, as well as addressing the challenges faced by immigrants in the United States. National Association of Latino Elected Officials Educational Fund (NALEO) - Provides programs that integrate Latinos into American political society, provide professional development opportunities and technical assistance to Latino elected and appointed officials, and conducts advocacy on issues important to the Latino community. National Council of La Raza (NCLR) - Headquartered in Washington, D.C. Works to reduce poverty and discrimination, and improve life opportunities, for Hispanic Americans. Through its network of nearly 300 affiliated community-based organizations, NCLR reaches millions of Hispanics each year in 41 states, Puerto Rico, and the District of Columbia. To achieve its mission, NCLR conducts applied research, policy analysis, and advocacy, providing a Latino perspective in five key areas - assets/investments, civil rights/immigration, education, employment and economic status, and health. National Day Laborer Organizing Network (NDLON) - The mission of NDLON is to improve the lives of day laborers in the United States. NDLON works to unify and strengthen member organizations to be more strategic and effective in their efforts to promote leadership development and to share best practices and models to improve quality of life issues. Together, NDLON and its member organizations foster safer and more humane environments for day laborers to seek employment and feed their loved ones. National Latino Congreso - Politics and policy convention of the Latino community in the U.S.
Pew Hispanic Center - Strives to inform debate on latino issues through dissemination of its research to policymakers, business leaders, academic institutions and the media: Demography, Economics, Education, Identity, Immigration, Health, Military, Surveys, Transcripts. Presente - A national organization that exists to amplify the political voice of Latino communities. Reforma - The U.S. national association to provide library services to the Spanish-speaking. William C. Velasquez Institute (WCVI) - A policy analysis organization that conducts research aimed at improving the level of political and economic participation in Latino and other underrepresented communities. Latin American Network Information Center (LANIC) - Facilitates access to Internet-based information to, from, or on Latin America. LANIC is affiliated with the Lozano Long Institute of Latin American Studies (LLILAS) at the University of Texas, Austin. This webpage last updated on Saturday, October 21, 2017 7:07 PM.